I don’t really have much of an update for this page, as Coffee An’ is still named Coffee An’ and it’s in the same location and still has a terrible parking lot and still makes good donuts. So I’ll tell a story. We (all four of us) stopped in recently on our way to Westport’s Earthplace. It wasn’t very busy, so the four of us sat down at the counter and each of us ordered one donut each. I don’t know why I found this so absurd, but I did. Each of us with plates with one donut on them. I went with the classic old-fashioned. It was delicious. Calvin, my four-year-old, was perplexed by my “boring” selection. Hoang, my wife and his mom, explained that this was because Papa was boring. I ate my delicious donut in silence. After successfully navigating the insane parking deathtrap inches from the busy road that Coffee An’ Donut Shop is on, we deserved a treat. 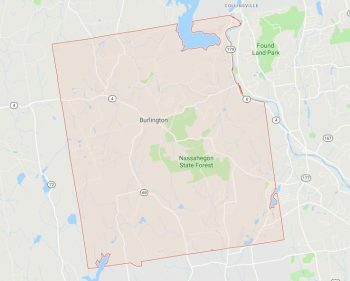 This oddly named little shop was the first stop of our daylong CTMQ adventure down here in the rich hideaways of southern Connecticut. Martha Stewart lived just down the road from this shop for years! Surely she ate here and surely the donuts would be delicious! We entered the little eatery and the owners/workers greeted us with a smile (it helps to have the world’s cutest kid in tow, but we’ll pretend they smile at everyone). I stared at the menu for a while – they offer much, much more than just donuts – and then looked for the reason we were here: A Devil’s Food Cake Donut. There were no labels, so I had to ask the guy if he had any left and he looked at me like I was from Mars. “Yes. Of course. 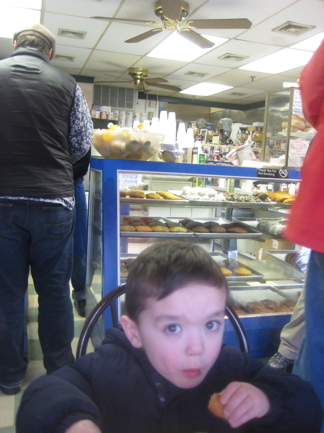 Right here,” here said as he slid out a tray of 20 chocolate donuts. And then when I ordered only one, his mustache twitched a little. Whatever, Hoang and I are trying to lose a few pounds to hit South Beach lookin’ good in April. We admit to being fickle in our love affair with Coffee An. 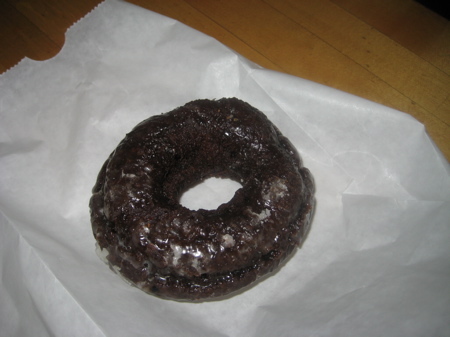 For a while, several years ago, we thought its chocolate donuts were simply the best on the planet. Then the place got sold and even though the new owners continued to use the old recipes, we felt the donut quality slipped. So we stopped going … and caught heck from many Roadfood folks who were clearly more loyal and devoted than we. Recently we returned to find a lot of changes, including photographs of famous fans of Coffee An Donuts all over the wall. There are now a few small tables where there were none, and gone is the counter at the window that let you look out at the parking lot while you dined. The low-stool counter inside behind the pastry case is still there, and lively as it ever was. The biggest change is the menu. No longer limited to coffee, donuts and minimal lunch items, Coffee An sports a broad lunch menu of hot and cold sandwiches. 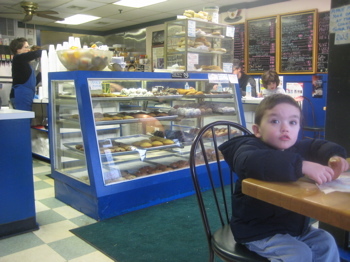 And the pastry selection is big, including muffins, turnovers, and bagels. There in the pastry case that occupies the center of the store as one enters the front door was a pan filled with our beloved chocolate donuts. As if we had cast eyes on an old flame after many years, our hearts raced. These donuts look just as good as we remember them, maybe even better. With a semi-crunchy sugar coat, they are devil’s-food dark; and as soon as we split one apart, we were smitten all over again. These truly are some luscious pastries! They are heavy, moist, chocolaty and high on the grease chart, in other words, impossible to stop eating. 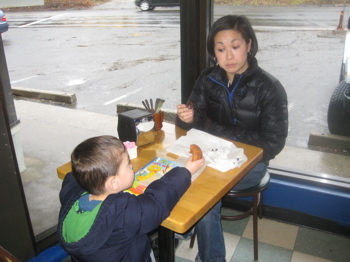 We also really like the plain cake donuts and the cinnamon-coated ones, each of which has a fine crunchy exterior. We’re glad that Coffee An is back in our lives. 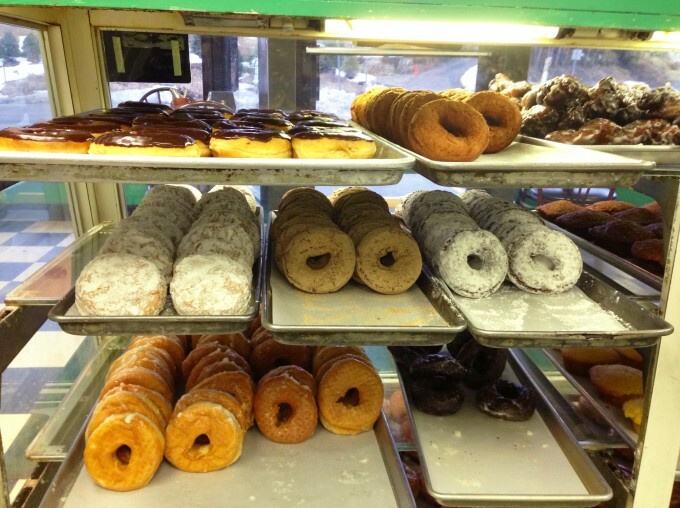 If you are a donut lover and don’t already know about it, you need to check it out. Especially if you are a chocolate donut lover. There’s nothing like Coffee An’s. Hm. As I have no pre-new owners experience, I have nothing to compare my chocolate donut at all. Other than what I think the perfect chocolate donut should be. And Stern (of Roadfood, above) nails for me, why these aren’t the world’s greatest. They are greasy and I don’t like greasy, especially in the morning. 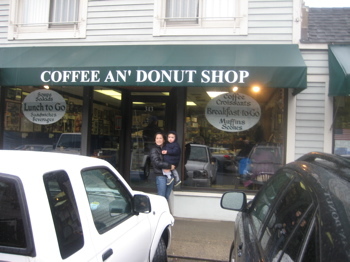 In fact, of the 4 donut joints on the Roadfood “Must Eat” list, I have to put Coffee An at the bottom. Keep in mind that it is still light years above Dunkin’ Donuts, but those cinnamon doozies at Dottie’s Diner are just untouchable. Sorry. The shop is quaint and cute and busting and fun – a great place to stop. It’s a few minutes off the Merritt and I would have no problem making this a stop on our family trips down to Delaware. Not at all. Note: Damian’s old-fashioned was excellent; as good as I’ve ever had. Even chocolate-lover Hoang agreed that she’d rather eat his than ours, which, if you know Hoang, is a pretty solid indictment of the chocolate dunker.